Wimpy Chest No More: 3 Chest Routines For Massive Growth! What can I do to lose my small, weak chest? This seems to be the most common weak point I hear about. Here are a few routines that are sure to blast new growth into your chest. Good luck! I get a lot of questions from people who complain of having a weak chest. This seems to be the most common weak point I hear about. I can relate because I&apos;ve always felt my own chest was weak in terms of both size and strength, so it&apos;s only fitting that I start off this new series on weak point training with an article on chest training. 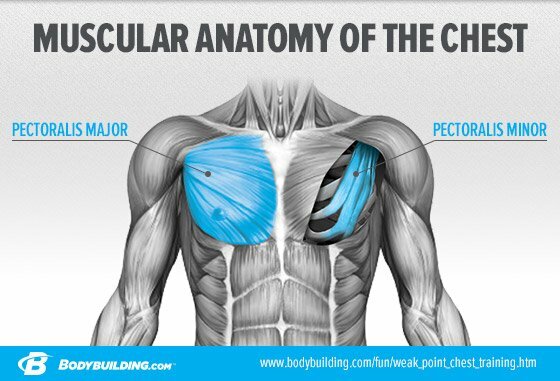 The chest is a complicated muscle, and one of the larger areas of the body. In fact, you can have several different problems with the chest: good size but a weak upper chest, not that much size and still a weak upper chest, maybe your inner chest just isn&apos;t right, maybe your outer chest seems weak, or worse yet, maybe your chest doesn&apos;t respond at all and you feel your bench presses in your front deltoids and in your triceps instead of your chest. Knowing the anatomy of the muscle you&apos;re training is critical, so we&apos;ll take at look at that first. Once you understand how the chest works during normal activities, you will find it easier to visualize how your chest works during your training. Often a weak muscle can be traced back to not feeling that muscle working. The pecs are attached to the humerus of the arm, right near where the shoulder joint is. They then run across the front of the body and originate on the breastbone. The pectoralis major is attached to the front of the body on the rib cage. The pectoralis minor is found underneath the pectoralis major. It originates on the ribs and attaches up to the scapula, specifically at the coracoid process. The pectoralis major brings the humerus across the body while the pectoralis minor moves the shoulders forward. Together, you get the bench press movement. Brining the arm across the body only gives you the fly movement. The chest may seem simple, but in reality it is not. When training the chest, you have to ensure complete development: overall chest mass, adequate upper chest development, adequate outer and inner chest development. The middle and lower areas are usually not a problem as the flat bench hits these areas pretty hard, but otherwise, no one exercise will completely work the entire muscle evenly. Of course, everybody wants to do the bench press, and everyone wants to know how much you can bench. While the flat bench press is a critical exercise, it cannot be the only exercise. Yes, you want to lift heavy for reps to build overall mass and the bench will be the core mass movement in the routine options I present, but you have to include a number of other movements and techniques to bring up a weak chest. "While the flat bench press is a critical exercise, you have to include a number of other movements and techniques to bring up a weak chest." Going back to feeling the muscle work, many people don&apos;t feel the chest muscle at all, this is largely a result of poor form and poor rep performance as well as not knowing what the chest muscles are supposed to do during the exercise. When setting up to do a bench press, you must stick your chest out and push your shoulders back into the bench. Stay on the bench, none of this twisting and arching like you&apos;re having some kind of seizure! Squeeze the chest muscles at the start, and do a slow, controlled rep - not some super fast rep, this isn&apos;t a race! Grip width and elbow angle in relation to the bar is important: you want a grip that&apos;s around shoulder width and elbows straight out at a 90-degree angle. However, play with both of these if it helps find a way to feel the muscles easier. I would also suggest putting your hand on your chest and, taking your other hand, slowly mimic pushing and flye movements to better feel how your chest muscles respond. I suggest the use of varying rep ranges and different intensity techniques to get the most out of a weak point program, which really means you&apos;ll be shocking the muscle with new and different training ideas, these will be presented in the routine options below. Remember to work chest first or on its own day for best results. If you do chest by itself, do deltoids and triceps on their own day, not to close to chest day to insure recovery. The usual ideas concerning nutrition and supplements work well here: adequate protein intake, meaning at least 1 gram per pound of bodyweight, divided over 6-7 feedings, including the critical post workout shake, adequate carbs leading into the workout for training energy, simple carbs as part of the post-workout shake and using supplements like creatine, NO, glutamine to enhance muscle growth, and to take advantage of the "cell volumization" idea. You can add any number of products to this basic stack, dependent on your goals. I do think you could add a multivitamin and joint product to the above stack; you don&apos;t want to ignore basic nutrition and joint protection. Concentrate on how the chest feels, and make adjustments in your form now as opposed to when the weight gets heavier. These are done as a way to extend the set, you should fail on the flyes and then change the angle of the dumebbells to "press style" to bring in help from the triceps and front delts, and keep repping to failure. Keep the incline low, as in one hole up, to minimize front delt involvement. Here, add 20% more weight to your heaviest flat bench, and, using a spotter or power rack, un-rack the bar and hold as long as possible, lowering slowly. By rest pause, I mean do as many reps as you can, rack the bar and count to 10, un-rack the bar and do as many reps as possible, rack it one more time for a 10 count, un-rack and knock out a final 2-3 brutal reps.
Do these reps in an explosive manner on the rise, and slow and controlled on the lowering portion of this exercise. You can focus in on certain areas by changing your grip. If your outer chest seems weak, widen your grip, you&apos;ll feel it much more that way. Don&apos;t come in with to close of a grip, while a close grip seems to hit the inner chest more it also heavily involves the triceps. This is a theory that really applies to the 16-21 year old age group, it&apos;s dependent on being able to stretch your ribcage and enlarge it which leads to a bigger chest. A lot of the old bodybuilders had a huge side chest shot because they had a huge ribcage underneath the chest muscles. Ever seen Arnold&apos;s side chest shot? Now, that&apos;s a chest! That look ties into this training technique. You do this technique with high rep breathing squats and dumbbell pull-overs. I think anyone can try it and maybe see benefits and it is, in fact, a popular training theory in itself. You do this superset by performing, after warm-ups, 1 set of 20 reps on the squat with a weight you would normally use for 10 reps.
As you fail, you pause and take deep breaths and keep going until you hit 20, then go right into a set of 12-15 reps on the pull-overs. It&apos;s a classic routine and it does deserve attention, so if you are still young, give it a try. Learn to use exercise density to your advantage, and you&apos;ll have the skills to make a workout fit any time slot. Follow this efficient, fast-paced, 4-week training program! Putting on quality mass isn&apos;t an overnight miracle. But you can jumpstart the process. Supersize your upper-body training with this efficient superset workout!